Being bissextile, it was the year James Rogers learnt that making his own addition to a £1 note passed at the Help Me Through The World Hotel for a pint with his mate Fred Foster would subtract eight years from his life lived free from incarceration. 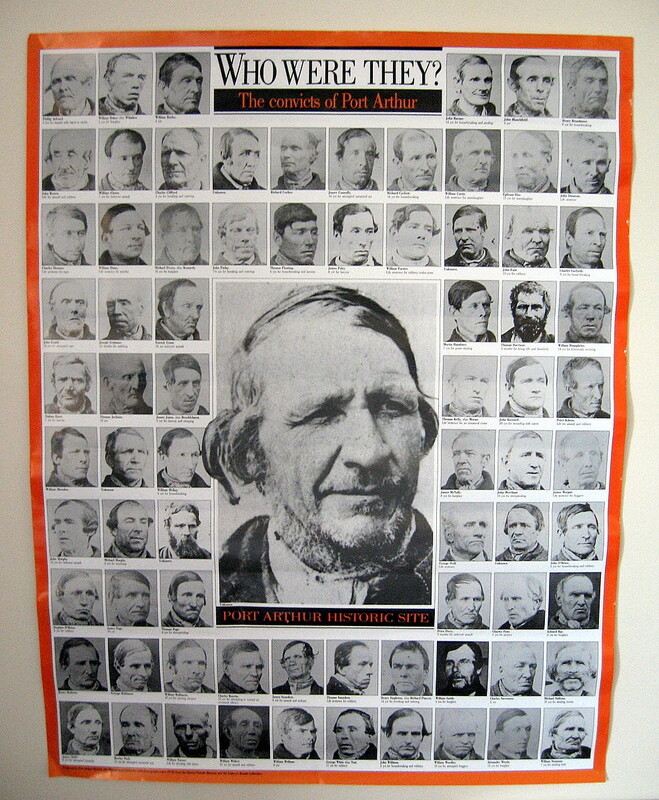 The number inscribed recto on the mount – “136” – was an archivist’s number which was shown to be one of dozens of missing mugshots when the Queen Victoria Museum and Art Gallery, Launceston, compiled a list of their holdings of these prisoner mugshots in the 1980s of all those donated from the estate of convictarian John Watt Beattie in 1930. 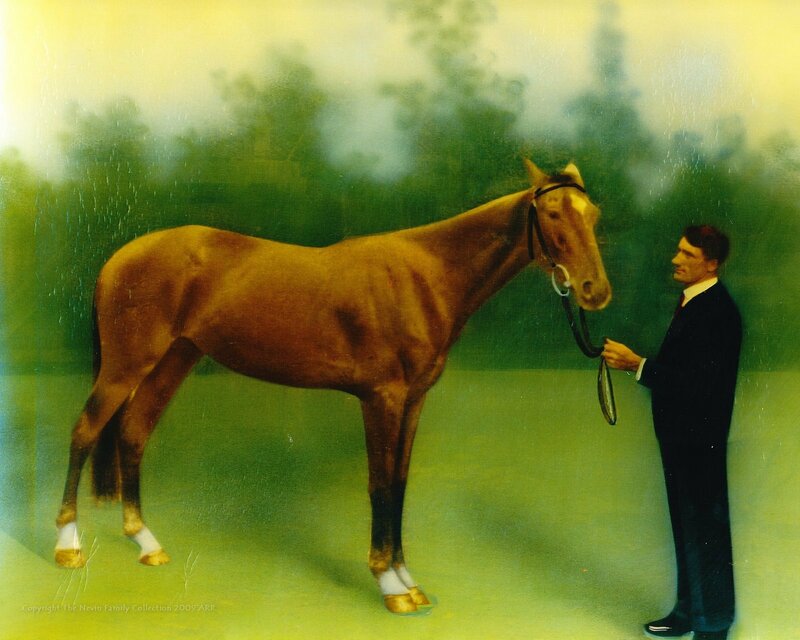 Those that were missing – including this one of James Rogers – were removed in 1983 from the QVMAG and taken down to the Port Arthur prison heritage site for an exhibition,and never returned. 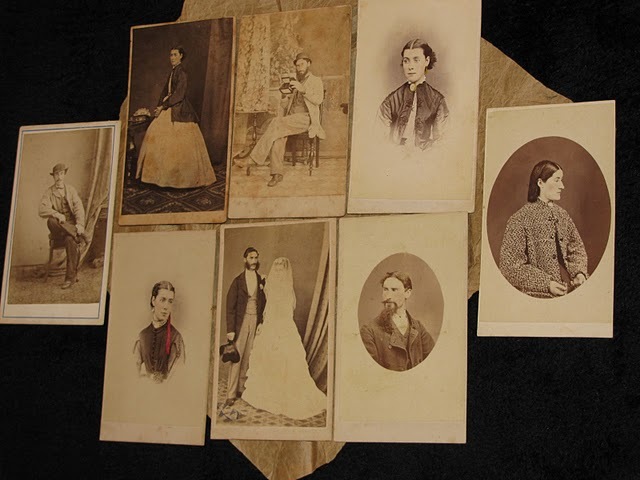 They were deposited instead at the Tasmanian Museum and Art Gallery, Hobart, along with another fifty (50) or more taken by Thomas Nevin in the 1870s, which were collected by John Watt Beattie in the 1900s, and are still held there today. See this collection by Nevin acquired as copies for this website in 2015 from the TMAG. 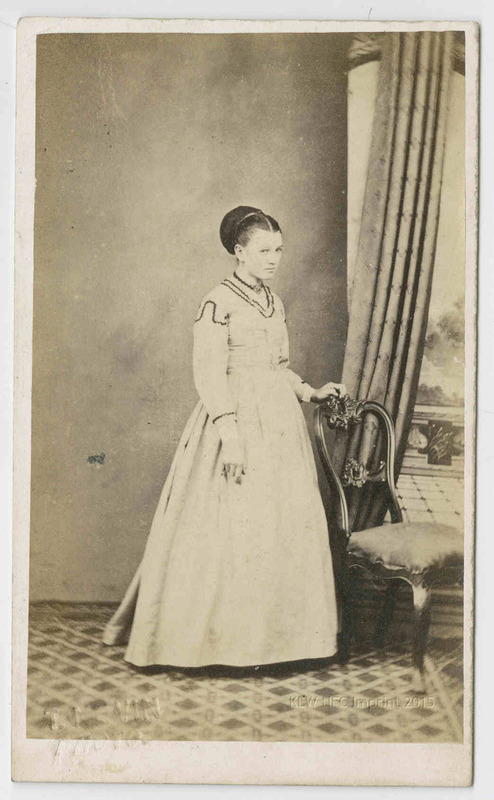 The inscription on the verso – Taken at Port Arthur 1874” – is usually factually incorrect, bearing little relation to the date and place of photographic capture and/or the criminal history of its sitter. Most of those extant were taken in Hobart at the Supreme Court, the Hobart Gaol and the Mayor’s Court, Hobart Town Hall. The inscription was uniformly applied as so much touristic spin on the versos of hundreds of these police photographs in buff oval cdv mounts, originals of which, taken by Nevin in the 1870s, were salvaged from the Hobart Gaol and Sheriff’s Office. They acquired heritage value as penal history artefacts to be exhibited and offered for sale in the early 1900s, at John Watt Beattie’s “Port Arthur Museum” located in Hobart, and for inclusion in travelling convictaria exhibitions associated with the fake convict hulk Success in Sydney, Melbourne, Hobart, Adelaide etc. 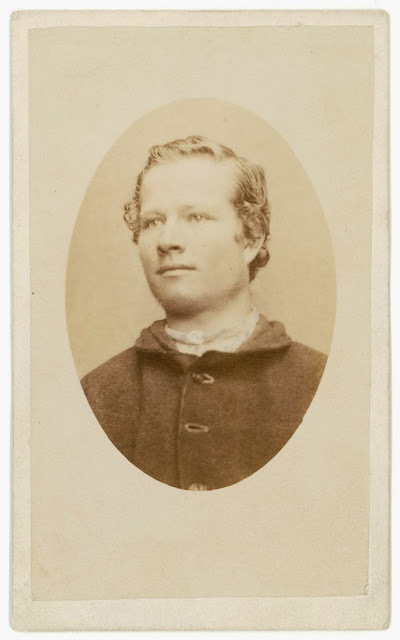 On this occasion, however, Thomas J. Nevin was on site at the Port Arthur prison, 60 kms south of Hobart on the Tasman Peninsula when James Rogers was discharged from there on 27th May 1874. Nevin’s several trips to Port Arthur under the auspices of the Port Arthur Surgeon-Commandant Dr Coverdale in 1874 commenced more than a fortnight earlier, on the 8th May, 1874, in the company of a prisoner whom he had photographed with the alias William Campbell but who was executed at the Hobart Gaol in 1875 with the name Job Smith. Thomas Nevin was in the process of photographing the prison inmates and updating police records against aliases, physical descriptions, and convict shipping records at Port Arthur when the birth of his son Thomas James Nevin jnr, was registered at Hobart on the 26th May 1874 by his father-in-law, master mariner Captain James Day. 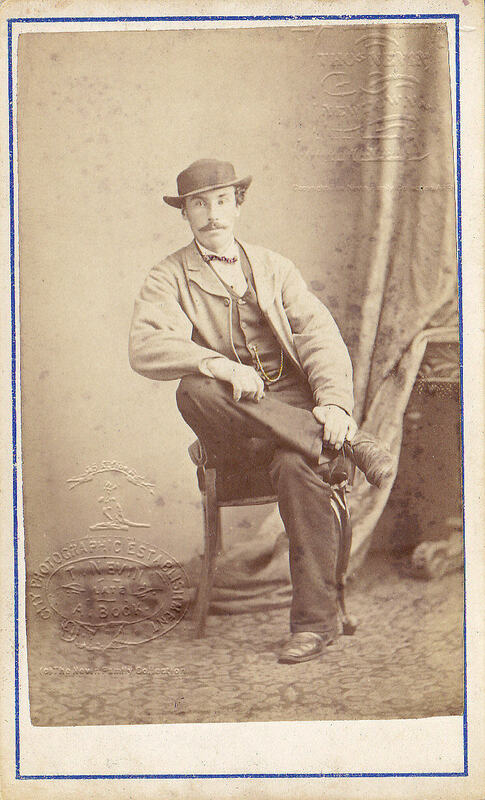 As a widower, Captain Day was residing at the Elizabeth Street photographic studio with his daughter Elizabeth Rachel and son-in-law Thomas when not at sea. His grandchild Thomas James Nevin jnr, (1874-1948) was born at his father’s studio, the City Photographic Establishment, 140 Elizabeth St. Hobart Town, on the 16th April, 1874 and given the exact same name as his father but because Thomas Nevin snr was still at Port Arthur during May working with Dr Coverdale, it was Elizabeth Nevin’s father, Captain Day, who signed on the 26th May 1874 the registration of the birth as the informant. 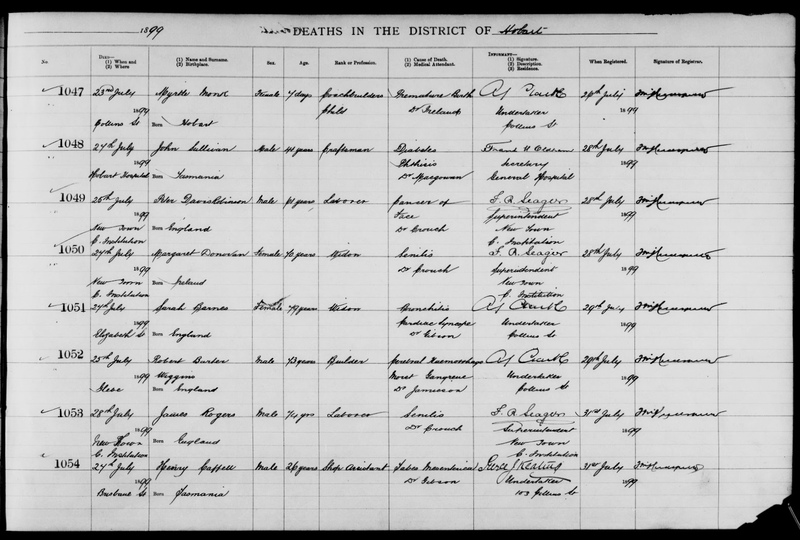 It was the only birth registration of all his seven children that Thomas Nevin snr did not personally sign as informant. James Rogers was tried at Birmingham on 12th July 1849 for stealing monies. He was sentenced to seven years, arriving at Hobart on 9th December 1852 on board the Lady Montague. Details on this record show he was 27 yrs old, a lamp maker by trade, 5ft 7in tall, and literate, with a speech impediment. According to this record, he was convicted twice – Again convicted Vide Misc. No. 2725 and again No. 8 No. 2885 – was written across this page. When James Rogers was convicted of uttering a forged note in February 1868, and sentenced to 8 yrs, he was about 43 years old. The press paid close attention to this case, reporting on the court’s decisions and witness depositions almost daily during February. Lavington George Roope’s deposition in particular demonstrated how the Bank of Australasia one pound note, similar to the Victorian one below, was modified by James Rogers when he tried to pass it off as a fiver. 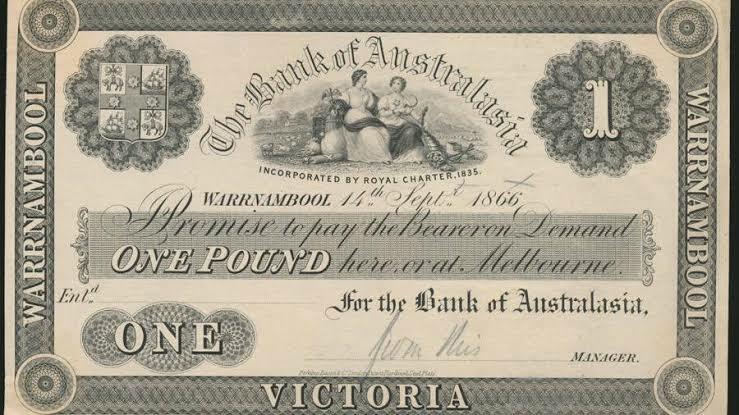 Above: A rare 1866 Bank of Australasia one pound note issued at Warrnambool, Victoria. The Bank of Australasia Tasmanian issue of the one pound note would have been very similar. UTTERING A FORGED BANK NOTE – James Rogers and Frederick Foster were charged on the information of Detective Morley with having on the 21st February inst feloniously uttered a forged bank note for £5 with intent to defraud. On the application of the informing officer they were remanded to next day. Source: The Mercury (Hobart, Tas. : 1860 – 1954) Wed 26 Feb 1868 Page 2 LAW. 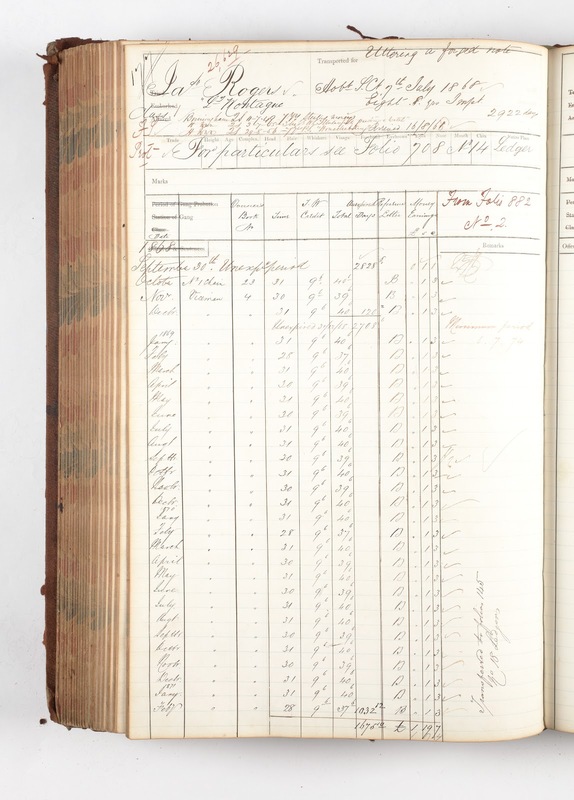 UTTERING FORGED BANK NOTES – James Rogers and Frederick Foster were charged on remand with having uttered forged notes of the Bank of Australasia. On the application of Detective Morley the prisoner Foster was discharged, there being no evidence available against him. Lavington George Roope deposed : I am a clerk of the Bank Of Australasia, in Hobart Town. The note produced is a £1 note of our bank which has been altered to a £5 note. In the right hand corner the figure 1 has been erased and the word “Five” has been written in. One of the numbers has also been erased in two places. The O and part of the N in the body of the note have been erased, and an F and an I have been substituted. The letter S has been added to the word pound. The word ” at” has been erased in the body of the note. The words one pound in the left hand bottom corner of the note have been erased, and the words five pounds have been written in in old English letters. In the genuine £5 notes these words are in old English letters. The letters O and part of the N printed in green across the note have been erased, and the letters F and I have been substituted, making the word ” Five”. I can trace the erasures in most places but not distinctly in the large letters. John Hutchinson deposed : I am cashier at the Commercial Bank in this town. I know Timothy Troy now present. I recollect his coming to the bank last Monday morning to make a deposit. A five pound note attracted my attention. It was originally a £1 note, and now purports to be a £5 of the bank of Australasia. I called Mr. Troy’s attention to this circumstance, and asked him where he got it. I cautioned him, took the number of the note,and forwarded information to the police. Troy then left the bank. Alderman Cook here took his seat on the Bench. The prisoner in the last case was removed a time from the Court. UTTERING FORGED BANK NOTES.-The hearing of the previous case was then resumed. Timothy Troy, licensed victualler, deposed ; I keep the Help me through the World hotel in Liverpool-street. I remember the prisoner coming to my house between nine and ten in company with Frederick Foster now present. The prisoner called for a pot of beer, which I served him with. He paid me 6d. for it. Afterwards the prisoner asked whether I could change a bank note, saying that if I could he would have some more drink. I said ” Oh, yes, I will change it.” He then called for another pot of beer, and I served him with it. He then gave me the note and I brought him down 19s. 6d. change. Prisoner said, ” I gave you a five.” I got a candle, brought the note back and four other notes, and said, ” you are right, it is a five.” I then gave him the remainder of the change. That was the only £5 note I remember having in my possession for months. The men had some more drink after that, and the prisoner paid for it. I think they went away together. They both came again on the Monday night, and had some drinks. The prisoner paid for them with a £1 note. I said, ” is this another five ? ” He, said not, but you can have another if you like, and putting his hand in his pocket produced another note. I gave him change of the £1. The men went away together again. On the following Monday morning I went to the Commercial Bank to pay in some money. I handed the deposit to Mr. Hutchinson. I told him I had got it on the previous Friday night. Mr. Hutchinson called my attention to the note, and told me it was a £1 note altered to a £5 note. I went to the shop where the man was working to see him, Mr. Swain’s foundry, and not finding him their I handed the note over to Detective Morley. The note produced is the same. The prisoner has been several times at my place-not very often. Frederick Foster, deposed : I am an iron moulder residing in Upper Liverpool-street. I know the prisoner. He has been a fellow work-man of mine for the last six years. He came to the gate of my house last Friday night. He said, ” Will you go and have a drink of beer?” I said ” Yes.” We went to the house of the last witness, Troy. We had a pot of beer and the prisoner paid for it. We had another pot of beer, and the prisoner tendered something similar to a note. Mr. Troy went away, was absent a short time, and then came back with 19s. 6d. which he put on the counter. The prisoner said ” It was a £5 note I gave you,” Troy said, “Was it, Rogers, I am very near sighted.” He also said to his daughter, “Light me a candle, Mary Ann.” He then took the candle and went up stairs to the box, as I supposed. In a short time he came back with a note in his hand, and said, ” All right, Rogers, it is a £5 note.” He gave it to his wife, who looked at it, and said, ” Oh, yes, Rogers, it is a £5 note.” The mother gave it to her son, who was sitting behind her, and he looked at it and said, ” Oh, yes, it is a £5 note.” The son gave it back to his mother, and I saw no more of it. Mr. Troy gave Rogers the balance of the note, deducting the price of the pot of beer. Rogers then paid for another pot of beer, had a drink out of it a then left me there. I went with the prisoner to Troy’s on the following Sunday night. We had some more drink there. Rogers paid for it with what I believe to have been a £1 note. There was nothing said that I remember about £5 notes at that time. The prisoner was not at work after dinner time last Thursday. He had not been discharged to my knowledge. I don’t think he had been. I did not see any more money with the prisoner on the Friday or Sunday than the £5 note and the £1 note. I think the prisoner’s wages were 5ds 6p a day. I knew no other means that he had making money beyond his trade. He has been in the habit of earning a few shillings in the beer-engine way, and in repairing pipes and the like, in over hours work. He is a brass-founder. He worked for anyone who would give him a job. I never saw him write. I know he used to put down his time for Mr. Swain on a Saturday. Source: The Mercury (Hobart, Tas. 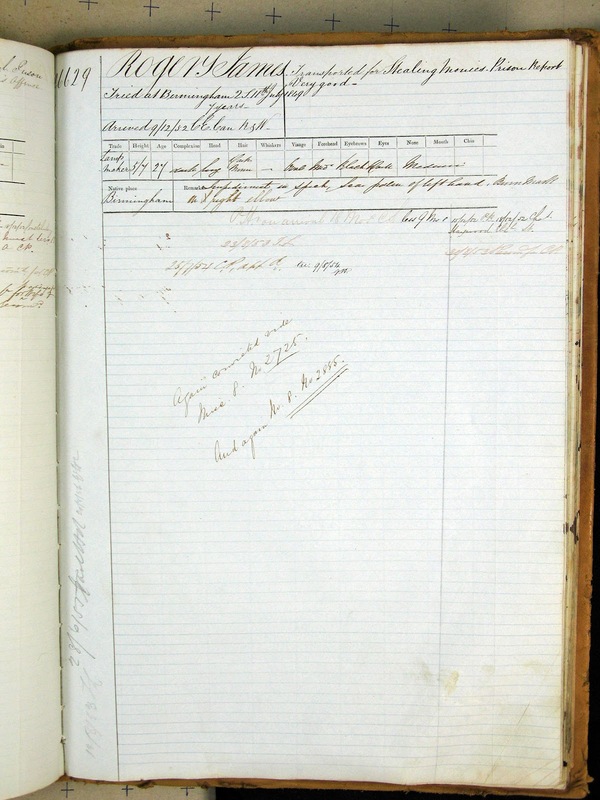 : 1860 – 1954)Thu 27 Feb 1868 Page 2 LAW. 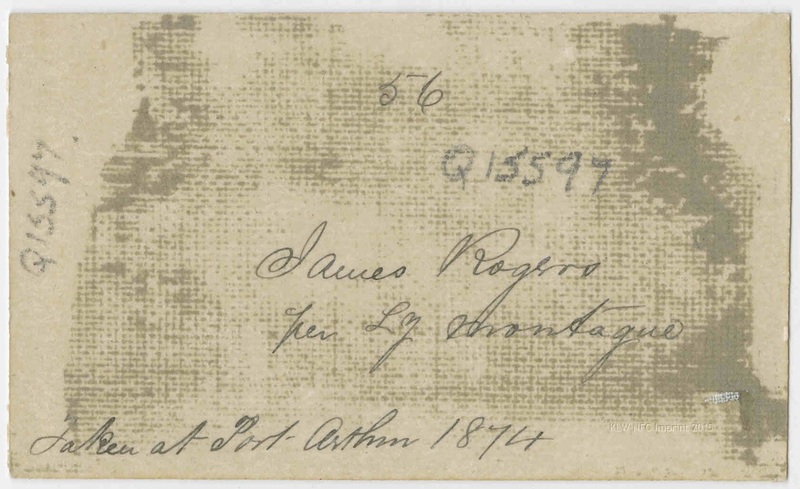 UTTERING A FORGED BANK NOTE – James Rogers was brought up on a charge of uttering a forged promissory note on the Bank of Australia. The prisoner was the same man who was examined on a similar charge on Wednesday last, and who was then remanded for the production of further evidence. Edward Daniel Swan, a clerk of the Bank of Australasia deposed that the note produced was a £1 note of the Bank to which he belonged which had been altered as to resemble a £5 note. It was presented to him by Mr. Barclay, a clerk of the Commercial Bank, to be unchanged. When it was recognised as a forgery Mr. Barclay took it away. Mary Linton deposed : I am a married woman residing with my husband Samuel Linton, a shoemaker. I know the prisoner, who has been in the habit of coming to my shop to make purchases. About 8 o’clock last Saturday evening week he came and bought things to the amount of 19s.6d., which he paid in silver. He came again between 9 and 10 o’clock to exchange a coat he had bought from me the same evening for another worth more money. He gave me what appeared to me to be a £5 note. Not having change myself I went into Mrs. McLaren’s to procure it. She said she had not change. She handed the note to my daughter, who goes on errands for her, to go out for change, my daughter went and returned with the change to my shop and I handed it to the prisoner. I believe the change was four notes and £1 in silver. My husband refused to let the prisoner have the coat, and the prisoner then went away. The prisoner was dressed in working clothing when he came to make the first purchases that evening. I don’t think I should know the note presented by the prisoner to me. The note produced is like it. Mary Ann Linton, daughter of the last witness, deposed : I am 12 years old. On Saturday night week last, my mother came to Mrs. McLaren’s for change of a note. Mrs. McLaren had not change, and she gave the note to me to get change at Mr. Sherwin’s. Mr. Sherwin changed it for me, giving me four £1 notes, and £1 in silver. I gave the change to the prisoner in my mother’s shop. My mother and father were present at the time. John Thomas Hutchinson deposed : I am cashier of the Commercial Bank. I know Mr. Sherwin now present. He came, to our bank on the 20th instant to make a deposit. I counted the money over in his presence. There were two £5 notes in it, one of which attracted my attention. It was on the Bank of Australasia, and just such another as that now produced. The other was I think on the Bank of Van Diemen’s Land. I saw there was some peculiarity in the Bank of Australasia note, but I told Mr. Sherwin I could not see what it was. I did not take the number of the note at the time. I took the note intending to look into it, but being, I think, past 3 o’clock at the time, and being very busy, it entirely slipped my memory. Next day it went up in the usual course by the exchange clerk to the Bank of Australasia to be exchanged. It was Mr. Barclay who look it. He brought it back immediately afterwards. In consequence of what he told me I said, ” That is the note I took from Mr. Sherwin last night; take it back to him at once.” I saw no more of it after that. William Sherwin deposed : I am a butcher carrying on business in Liverpool-street. I know the little girl, Mary Ann Linton, now present. On the evening of last Saturday week she came to my place for change of a £5 note. I looked at the note against the gas-light, but could not detect anything wrong in it. I don’t remember noticing what bank it was on, I changed it, and the girl went away with the change. I don’t exactly remember what the change was, but I gave her some silver I know. I cannot say positively that the note produced in the same, but I have every reason to believe it is. I put the note with my other money. There was only one other £5 note amongst the money, and that was on the Bank of Van Diemen’s Land. I took it to the Commercial Bank with the other money on the following Thursday. Police Superintendent Propsting deposed : I know Mr, Sherwin, the last witness. On Friday last he gave me the bank note note now produced. Detective Morley deposed that on Monday last in consequence of information received he went with Detective Tickers to the prisoner’s place in Campbell-street. He found prisoner in the yard, and apprehended him for uttering forged bank notes. He said nothing. Witness took him up stairs to a room, and told him he would search it. After witness had been searching for about five minutes prisoner said, ” You’ll not find any notes’.” Vickers was afterwards turning over some rubbish in a corner when prisoner said, “You will find no thing there but some screws belonging to me.” I then saw Vickers find a bunch of skeleton keys. I brought the prisoner to the watch-house. On searching him there found two £1 notes in his right sock, two half-crowns in his left sock, and £1 and some silver in his pocket, making a total of £3 15s. 12 1/2d. Two hours prior to the prisoner’s apprehension I received from the witness Troy’s bank note purporting to be for £5, which Mr. Troy marked and took tho number of in my presence. The prisoner was then committed for trial. Source: The Mercury (Hobart, Tas. : 1860 – 1954) Sat 29 Feb 1868 Page 4 LAW. BEFORE His Honor Sir Francis Smith. James Rogers pleaded guilty to uttering a promissory note, knowing it to be forged. James Rogers, convicted on his own confession of uttering, was sentenced to be imprisoned for eight years. Source: The Mercury (Hobart, Tas. : 1860 – 1954) Thu 9 Jul 1868 Page 3 LAW INTELLIGENCE. 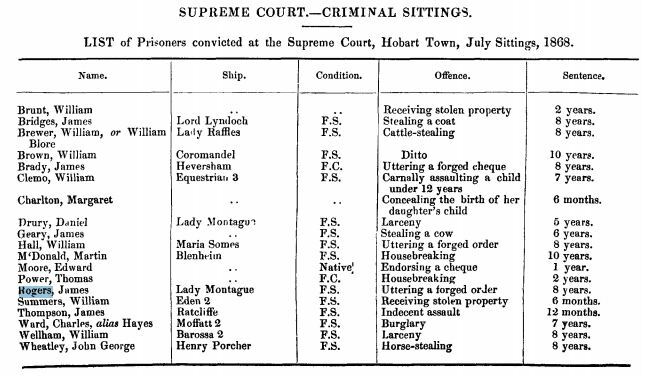 At the criminal sittings of July 1868 at the the Supreme Court, Hobart, James ROGERS, per Lady Montague, Free in Servitude, was sentenced to eight (8) years for uttering a forged order. Several other prisoners convicted on this date were later photographed for police records by Thomas J. Nevin at the Supreme Court, the Hobart Gaol and Mayor’s Court during incarceration and on discharge, and again if a repeat offender. James Rogers’ further convictions – if any – prior to his death in 1899 – will be added in this space if discovered from primary sources. 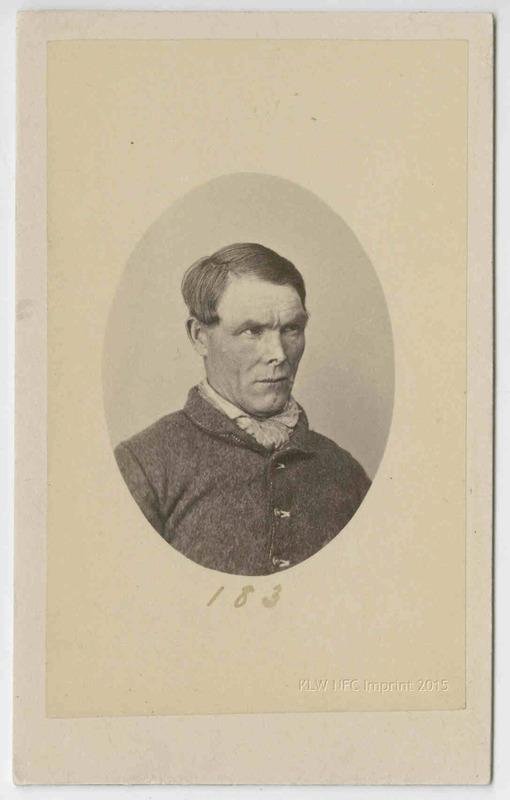 James Rogers was discharged from the Port Arthur prison during the week ending 27th May 1874. He was 48 years old, FS (free in servitude) according to the notice published in the weekly police gazette. 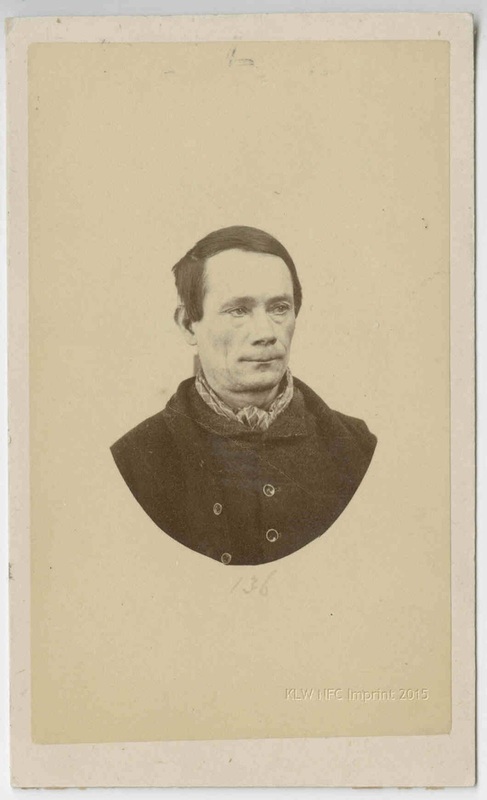 He was photographed by Thomas J. Nevin in the previous week, as per regulations, between 23rd May and the date of discharge, 26th May 1874, from the Port Arthur prison. Had Nevin still been in Hobart before that date he could have registered the birth of his son, Thomas James Nevin jr, born on the 16th April, 1874 to his wife Elizabeth Rachel Nevin at their studio, the City Photographic Establishment, 140 Elizabeth St. Hobart Town, in April. But because of his government contractor commitments to photograph prisoners and update records, he was detained at Port Arthur, 60 kms south of Hobart. 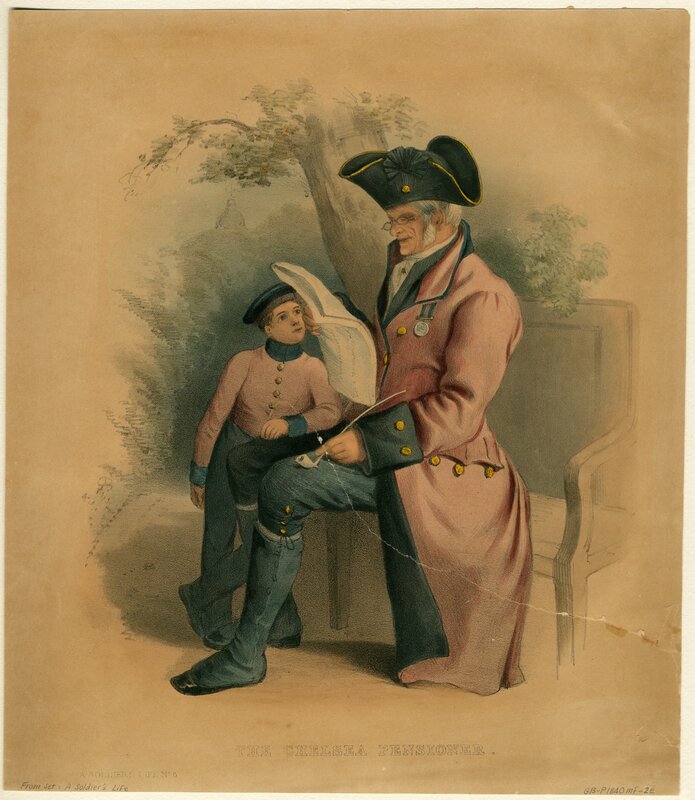 His father-in-law, (his wife Elizabeth’s father) master mariner Captain James Day, signed the birth registration of Thomas James Nevin jnr as informant instead, the only birth registration of all his seven children that Thomas Nevin snr did not personally sign as informant. 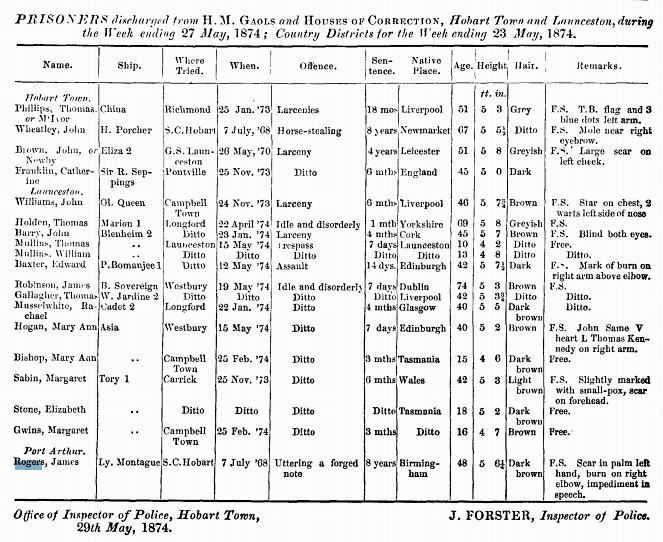 In all probability, James Rogers committed further offences well into his senior years, and when or if the primary documents are located, they will be added. He seems not have married nor, it would seem, did he leave the colony of Tasmania, dying as a pauper at the New Town Charitable Institution at the relatively healthy old age of 74 yrs, give or take the onset of senility, registered here as the cause of death. James ROGERS, male, 74 yrs old, laborer, born in England, died of senilis at the New Town Charitable Institution, once the Queen’s Orphan School which closed in 1879.